Do you think this Shea Butter will work for me? I'm able to pick it up locally for $10 (7oz jar). Looks good, Mike! Let us know how you like it. Randy, i highly doubt the NOW brand shea butter is unrefined. It does not state it on their product and just by saying "natural" does not mean it is unrefined. i believe it is white-coloured in texture and that would indicate it is refined. i hope you can find some unrefined butter, Mike. Good luck. thanks for the link. I'll have to look into picking some up. I know the PdP shea butter I have was expensive as heck. Celestino, which shea butter do you use? edit- I started a new thread here for shea butter to keep this one about prep. (08-03-2012, 06:33 PM)celestino Wrote: Randy, i highly doubt the NOW brand shea butter is unrefined. It does not state it on their product and just by saying "natural" does not mean it is unrefined. i believe it is white-coloured in texture and that would indicate it is refined. i hope you can find some unrefined butter, Mike. Good luck. I will try contacting NOW sometime next week and asking them directly if their Shea Butter is unrefined or not. Mike, good luck with your inquiries. i would PM Randy to see how to go about acquiring some. i find it hard to believe that you can not get some good unrefined shea butter where you live. You can find almost anything in the US. Do a google search for unrefined shea butter in your city or area and i am sure you will come up with something. Good luck. (08-04-2012, 07:15 PM)celestino Wrote: Mike, good luck with your inquiries. Spoke with NOW this morning and they confirmed their Shea Butter is refined (processed). I will check Walgreens as you suggested via PM. I no longer live down the road from a Whole Foods, but next time I'm in that area I will pop in and see if they sell any Unrefined Shea Butter. Good luck to you, Mike. i hope you get some soon. i hope you are well. So many different Preparation methods. At the moment, I am refining my Pre-Shave Steps and I will use this information in assisting me in testing what will work for me. One Factor is Time. Another is Cost of the items used. And still another is being consistent in the application of each step. So while YMMV in how each step works for you the main point is finding what works for you in getting your Whiskers Ready for Shaving. So I will start with Shower Steps since I shave after the Shower and will experiment in the Shower by using Regular Soap, Shampoo/Conditioner, and/or a Facial Scrup first and then go from there. It seems to me that one of the steps is to make sure that your Whiskers and Face is clean of Oils and Grime. A byproduct of that is that your Whiskers get a little damaged from the Soap/Conditioner/Facial Scrub and get a little more damaged from the Hot Water. Once damaged the Whiskers will absorb the water and become more flexible. So the Goal of this process is to damage the Whiskers to absorb water and make them more flexible. So any number of steps will work alone or in combination and all you need to do is find the best combination that works for you. It also seems to me that another byproduct of a Preshave Preparation Process is to provide some protection to the face. 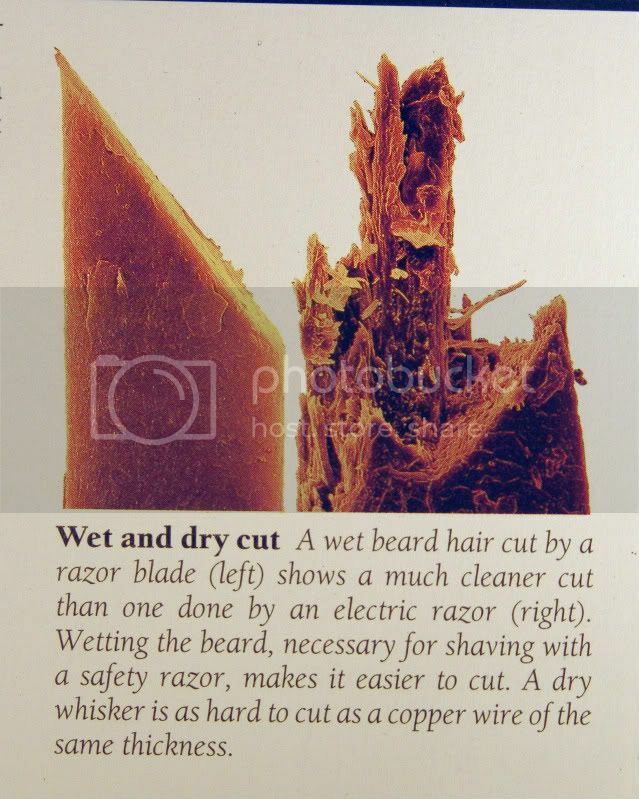 But, how much additional protection you may need will depend on the soap/cream, razor/blade technique, and other shaving steps you use. All this really does is give you one more thing to about as you develop your own Preshave Routine and Shave Routine. Since joining The Shave Nook I have learned a great deal of shaving techniques. Including prep, loading soap and creams, and different blades. Great to hear that you gents are getting some great shaves as a result of your prep! Enjoy your shaves, gents. The best prep for me is a shower before shaving. That's probably the most universally applicable statement this thread will see. I use Kings shave oil about 15 min before I shave seems to work for me. I went the Noxzema route for a while, then I read a thread about using a good quality hair conditioner. It worked great for me. I use Paul Mitchell hair conditioner and put it on while in the shower. I don't rinse it off but just massage it in for a minute. Great source of hydration and slick to boot. (07-28-2012, 01:58 PM)ShadowsDad Wrote: FWIW, the shave prep is just a modification of the "felting" process. Felting is a process that produces felt from natural animal hairs. The difference is that for shaving we do it "on the animal" that would be us, and the hairs are very short. And the goal is different between felting and shaving, but the process is quite similar. ANY soap or detergent and warm water mixed with the hair will result in the hair softening and that's the goal in shaving. That's the basic process. Take it further with the hair significantly longer and off of the animal and it'll "string" together and make a mat (felt). The minor details are just what works for the individual to fine tune it for the skin. Here's the why. Sure it's an electric razor, but it stills shows the difference. On finding your site, the first thing I cam a cross was the idea of whisking a loaded brush in a bowl. I love this idea and will do it myself. I have pretty sensitive skin, but more importantly, being new to all of this, I really would like to have some great shaves for my head. I have some good ones, but there are just too sparse.